Students will vote for new executives, senators, and councillors. They will also vote on five referendum questions. Quorum for the election in 450 members. Currier, a second-year student at the Liberal Arts College, was attracted by “political and social change” in the LAC community. She acted as the Social Coordinator for the Liberal Arts Society this year, and she’ll keep that position next year. Currier joined the CSU during the 2016 by-elections and is a member of the Clubs and Space Committee and the Sustainability Committee. The choice to run again came after realizing that she wasn’t able to “engage in larger initiatives” during her short term. If elected, Currier wants to work with groups such as Sustainable Concordia to “continue reforming our University in the direction of eco-sustainability. “Social sustainability should promote inclusivity and incorporation of the diverse Concordia community,” she said. According to Currier, sustainability is not only about environmental issues, it’s also about social sustainability. Milton has spent the last year on the ASFA’s Council of Representatives for the Concordia Association for Students in English (CASE). During his time there, he joined both the Policy Review and Academic Committee. He also became the Editor-in-Chief of the ASFA’s first academic journal, to be published at the end of semester. Leddy is currently doing an honour’s degree in Human Environment and a minor in Sustainability. He has volunteered in organizations such as Sustainable Concordia, ReThink Waste and Integrated Symposium. In the past year, Brittany has been a student-at-large at the CSU. She sat on the Clubs and Spaces committee where she “reviewed new club applications, special club funding requests and budgets allowed to each club.” In high school, she was elected to the Student Council her last year and was part of her school’s Social Justice Club. Second-year English literature student Maidina Kadeer was on the CSU Senate this year, an experience she says helped her understand the inner workings of how Concordia and the CSU operate. She has also been involved in re-constructing the Amnesty Concordia constitution and is currently working on initiatives within her own program regarding racial equity and diversity. She has a keen interest in food politics and sits on the Board of Directors of The Hive Concordia Solidarity Co-Op and The Concordia Food Coalition. Fabre hopes to become a more “active and vocal member of the Concordia undergraduate community” as CSU Arts & Science Council representative. She wants to help develop Concordia into a more environmentally friendly and progressive campus by upholding and protecting the rights of community spaces like The Hive and the Greenhouse. She is also a volunteer at People’s Potato. Fabre wants to readjust the “out-of-date” recycling and compost system on campus in order to take steps towards a more sustainable and environmentally conscious institution. “I find that small, incremental changes, over a period of time, with the support of an entire community, can make long lasting differences and perpetuate real change,” he said. Rydzewski is currently running for VP internal for Political Science Student Association. She advocates for union transparency, and hopes she will help maintain fair representation in the CSU and keep the next executive accountable to the other members. Running as the Arts and Science Representative in the CSU, Thomas David-Bashore has some experience in student politics as the former president of the John Molson Sustainable Enterprise Committee. He has also been involved in overseeing recent by-law changes of the Political Science Students’ Association. David-Bashore’s primary focus in the CSU would be to help reform voter turnout in CSU elections, as current undergraduate participation in these elections is under 10 percent. “The CSU acts as the voice of Concordia students; it represents what we are for, or against, and is at the core of a lot of student mobilization,” says David-Bashore. Martel was elected to CSU Council during the last by-election, and has since been serving on the appointments committee. He has also sat on The Hive Co-Op’s Board of Directors and currently sits on the policy and governance committee. As well, he is an ambassador for the PSSA. Martel plans to “push for more participatory initiatives at the CSU” by involving students in committees and budget planning. As a previous VP Finance of the Concordia Undergraduate Psychology Association and a current VP Finance of ASFA, Christina hopes she can bring that same financial awareness to the CSU and learn more about student politics by joining the union. At ASFA, she had a hand in creating policies, bank accounts, fixing discrepancies, and adjusting budgets, among other things. “We did spend too much on frosh and orientations this year but that is mostly because we didn’t make the revenue expected. I am hoping to work with the VP finance next year to make sure that doesn’t happen again,” she said. Poirier Lavoie has been the Arts and Science representative on the CSU council for over two years. He served as President of the Political Science Student Association, a held the same position at the Parliamentarian Society of Concordia. He is “keenly aware that an increasing amount of students are disenchanted with the union” and wants to fix this by working on the CSU’s transparency and representation. Lamoureux-Sproule has served as Coordinator of Communications on the Sociology and Anthropology Student Union, and has been involved with the Centre for Gender Advocacy. She worked with the “A Safer Concordia” campaign and helped push a new policy on the university’s administration. Lamoureux-Sproule could not be reached for further comment by press time. Williams is the outgoing Loyola Coordinator for the CSU. She has been involved with the Hive Cafe Solidarity Cooperative, the Concordia Food Coalition, and the Sustainability Action Fund. Additionally, she was an Arts and Science Councillor on the 2014/2015 CSU council. Williams could not be reached for further comment by press time. Young has sat on the ASFA council of representatives for the Liberal Arts Society, and served as ASFA’s VP Internal following the previous VP’s resignation in January. Young could not be reached for further comment by press time. Mikaela is a second-year student at Concordia, majoring in Art Education. Inspired by the “student movement and activism” at Concordia, Mikaela wants to join CSU to be part of the student union’s initiatives regarding “accessibility, inclusion and student voice.” Projects such as the Hive and the Cooperative Student Housing project have motivated the Art Education student to run. Her role as a senator has given her “a deeper understanding of how decision-making works” and better knowledge of issues, such as the student tribunals. 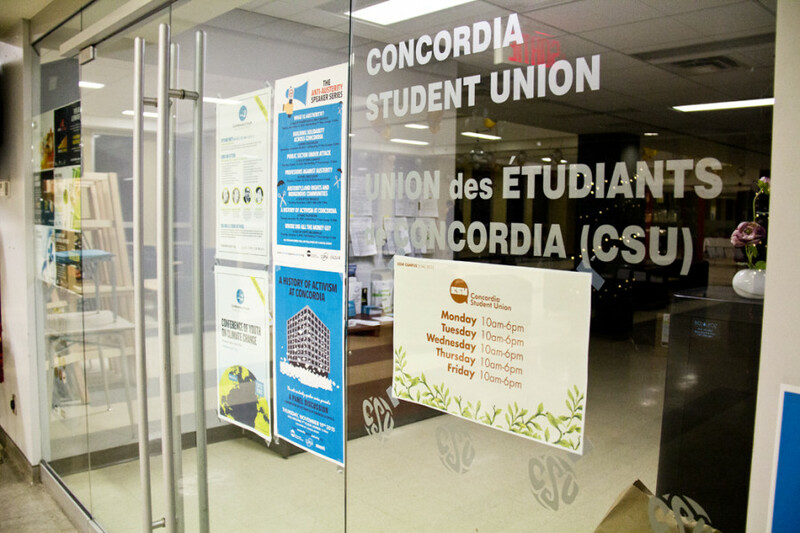 “The students learning should not be placed second on Concordia’s focus,” Clark-Gardner said. This past year, photography student Stephen Karchut helped push for by-law changes that he believes will foster greater transparency and accountability at ASFA, and now wants to get more involved at Concordia. Badr is an engineering student looking to keep the concerns of the engineering department relevant to the CSU. “We are noticing that the numbers of the engineers joining the union compared to other faculties is continuously decreasing. For this reason, I would like to make sure that the engineers are not forgotten by the union,” said Badr. In addition to bringing the gap between the union and department, he explained that he wants to increase the access of funding for engineering initiatives. He thinks he can bring the same success and “high turnout” to CSU organized events as he has in previous associations and organizations he has been involved in, like Concordia Egyptian Association and MAC Montreal. “I looked around my classrooms in order to gauge what percentage do the women make up, and it seems the number is somewhere between 10-30%,” he said. Alavi Alkirbee has been involved with the Burrito Club of Concordia, the Society of Automobile Engineers, and the Egyptian Association of Concordia. He could not be reached for further comment by press time. Joyce-Christiane Kakou has experience with Model United Nations and was on the First-Aid Team at Champlain College. She has also participated in Concordia Hackathons. She could not be reached for further comment by press time. Gelinas-Delisle believes “it is a huge problem that most JMSB students are unaware of the services their tuition pays for,” and wants CSU to explain these services and engage students in knowing all that is offered to them on campus. The lack of JMSB representation in CSU over the past years worries her and as a result she is doing her part in keeping up her faculty’s representation by running as a CSU representative. Destounis has recorded no past experience with student politics or on-campus groups in his written statement on the CSU elections website. He cited his time in JMSB as the experience that will help him as a councillor. Louis has recorded no past experience with student politics in his written statement on the CSU elections website. However, he has worked as a Concordia tutor. Macfarlane has recorded no past experience with student politics in her written statement on the CSU elections website. She has experience working at Awenda Provincial Park, has been a restaurant host and servers, and tutored elementary school students in language and math.